Want to start eating local? Foraging in your own back yard? Unless ChemLawn makes weekly visits, front lawn dandelions are delicious. Early spring through the fall, Salade Lyonnaise, a dandelion salad is a perfect meal. 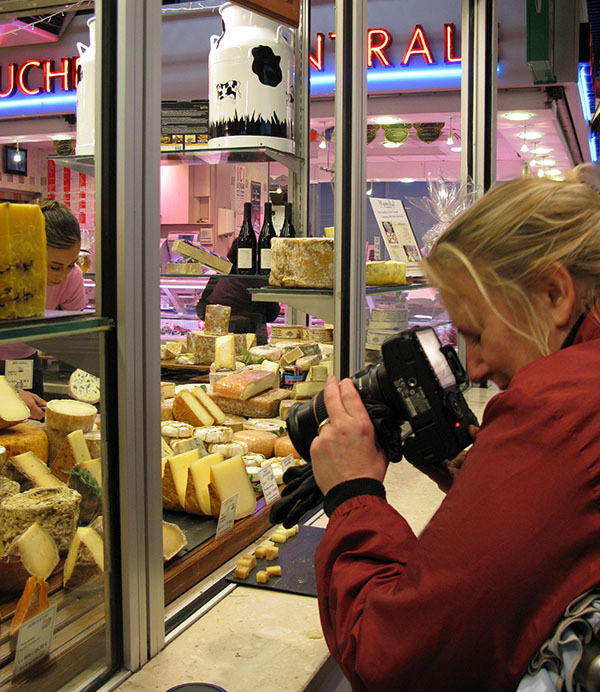 A few years back I toured the old city of Lyon, France with Lucy Vanel, a talented writer, photographer, baker and cook leading a flavorful life in Lyon, France. That city holds a special attraction for me. It was one of the first places in France that I visited as a teenager. And a day with generous Lucy as my host was a treat. 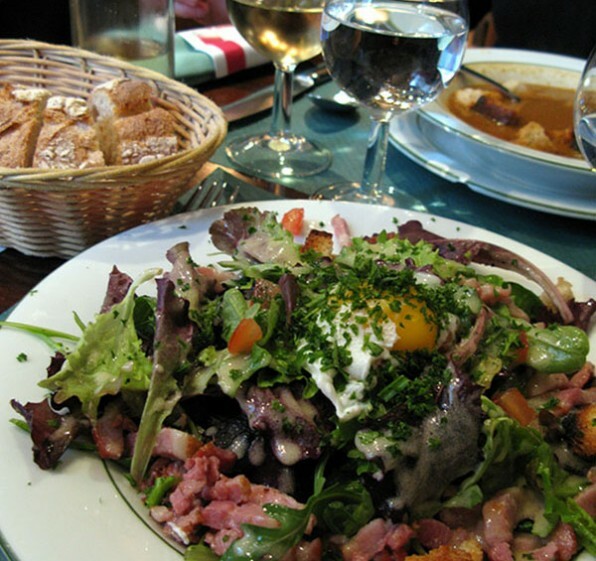 We ate a Salade Lyonnaise in the city of its birth at a restaurant Lucy feels maintains its quality and charm. (It’s called Le Val d’Isere.) 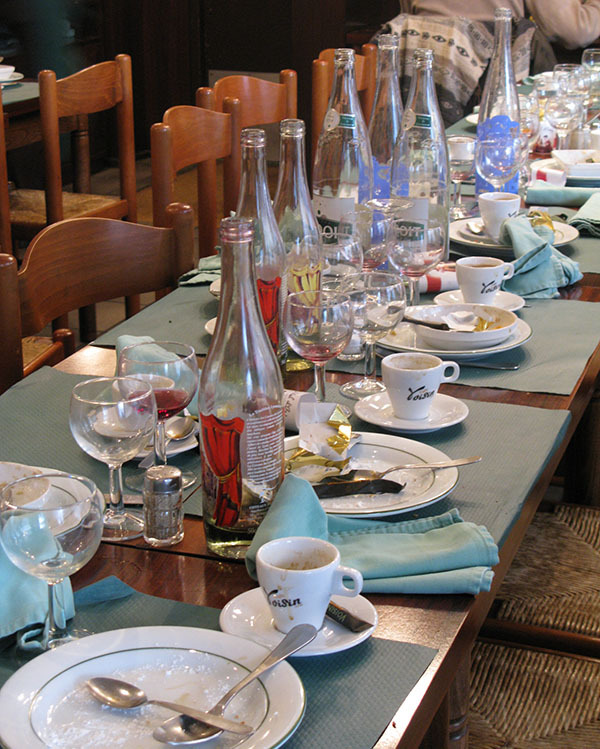 Judging by the rush at lunchtime when we ate there, the locals agree. In homage to Lucy and her adopted city, here is my version. The salad is a bracing combination of crisp bacon lardons, pickled herring and a poached egg. (The herring is an odd touch and optional. For the city’s famed silk workers, who made brocade for Marie Antoinette, herring was a diet staple.) I like to make the dressing from some of the hot bacon fat left in the pan after frying the lardons. The greens wilt and soften slightly, just enough to make them easier to eat. Select dandelions that have not yet flowered. These will be mild and tender. Use a screwdriver or weed digging tool to extract the greens along with their roots from the earth. After you’ve collected a good-sized salad bowl full, dump them into a sink of cold water. Stir the water to loosen any soil and debris. (Pine needles cover our lawn and are a nuisance to pick out of the greens.) The roots are edible. Just scrape them with a paring knife to remove the tough outer skin. For the Garlic Croutons: Preheat the oven to 350°F degrees. Heat the olive oil in a cast iron or black steel skillet over low heat. Add two crushed garlic cloves and the bread. (For bread use 4 slices of crusty peasant bread or 8 slices of French baguette, cut into 2 inch cubes) Cook gently for five minutes stirring often. Place the pan into the oven and cook for 10 to 15 minutes, stirring occasionally until the croutons are golden brown. Remove from the oven. Discard the garlic cloves before serving. For the Salad: Wash the dandelion greens. Pick out any bits of grass, browned leaves or pine needles. Leave small clusters of dandelion leaves intact. Have a wide pot for poaching the eggs on a low simmer. Divide the greens between four dinner plates. Garnish each plate with pieces of the herring and tomato wedges. Render the bacon in a heavy cast iron skillet over medium heat. When the bacon is crisp, pour off all but 2 Tablespoons of the fat. Add the chopped garlic and cook for about 30 seconds. Add the vinegar, the mustard and a few twists of the pepper mill. Check the seasonings for salt. Salt the poaching water. Add the eggs. Bring the heat up to maintain a low simmer and poach the eggs for about 4 minutes until the whites are just set. Or longer to your taste. Remove each egg with a slotted spoon from the water. Drain any water from the egg by placing it on a paper towel then place each egg on top of the salad. Pour the warm dressing over the dandelion salad. Top with the garlic croutons.